It's no secret that my default lunch place is EARL Canteen: I am there with terrifying frequency, and not just because I am friends with Jackie and Simon, the proprietors. It's because their sandwiches really are THE BEST SANDWICHES IN TOWN. 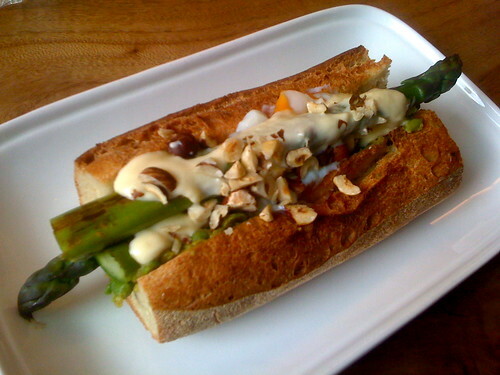 I've written about their sandwiches before, so I'll limit myself today to saying that you HAVE to try two of the new additions to their menu: the baguette with organic asparagus, mushie peas, slow cooked egg, taleggio cream and hazelnuts ($13.50) and the Earl Grey macaron ($2.50). Both are sensational. But today I wanted to write a post about some of the other lunch places in the city's legal district, where I work. 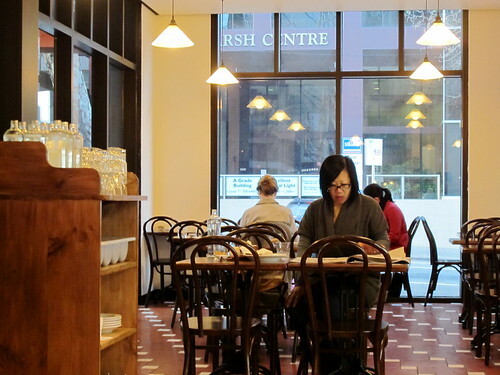 Some time ago I wrote a series of blog posts I called 'The King / Bourke Quest', which catalogued my at times futile attempts to find a decent lunch in the vicinity of the corner of King Street and Bourke Street. How times have changed! 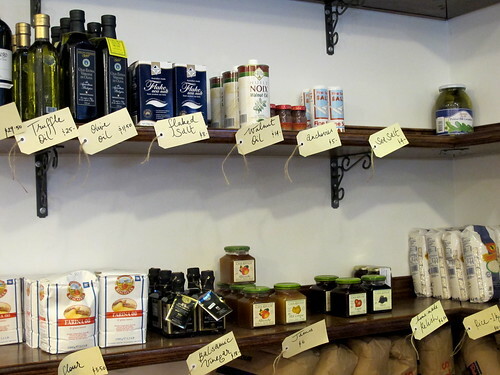 I'm happy to report that in the last six months a string of new places has opened, providing much more choice. Here's a round-up of the most noteworthy over the last few months. A feel-good, not-for-profit haven in the corporate jungle. Kinfolk is sunny little cafe in Donkey Wheel House, the gorgeous Venetian Gothic building at the very end of Bourke Street near Southern Cross Station. 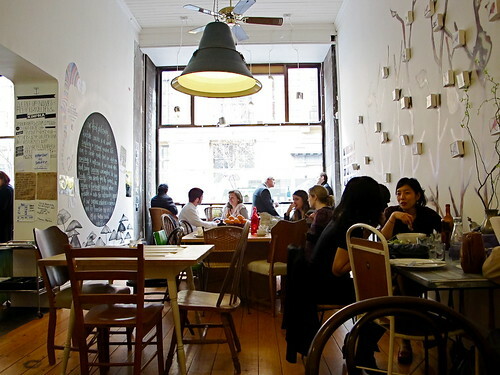 The cafe redirects its profits to selected local and international development projects (by adding a coffee bean to one of four jars when paying the bill, patrons can have input into which projects get the funding). It's staffed partially by volunteers so service levels can vary at times, but the place is so cute and well-meaning that it'd be churlish to let that bother you. 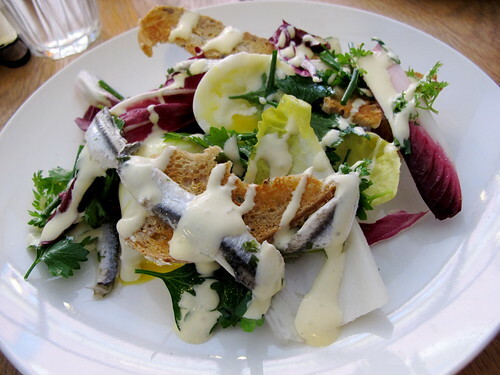 The changing menu will generally feature half a dozen sandwiches and salads, always with a few unusual ingredients. 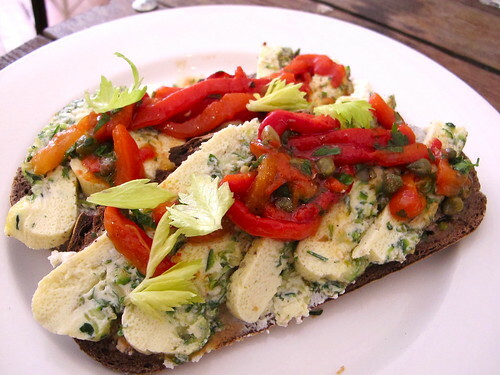 In the past I've enjoyed zucchini and goats curd frittata and red pepper relish on rye ($8.50) and poached chicken, celeriac shavings, frisee and mustard aioli on sourdough ($8.50). 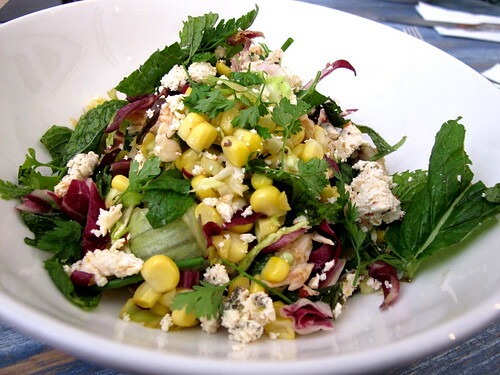 Salads have been good too: radicchio, white anchovy, soft boiled egg and mustard cream dressing ($9.50) and a corn and mint salad whose details are sadly lost in the mists of time. The chairs are mismatched and the vinyl can be crackly, but the coffee is good and Kinfolk is often the perfect antidote to a hectic working day. 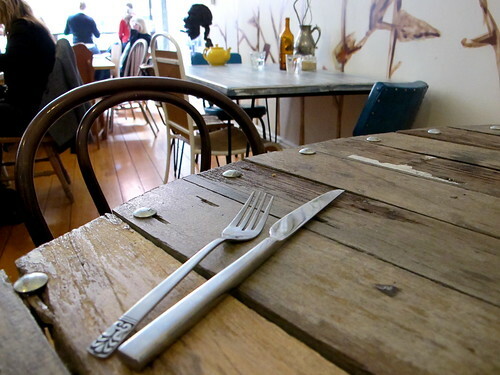 About six months old, Le Traiteur is owned and run by the team behind North Melbourne bistro Libertine. 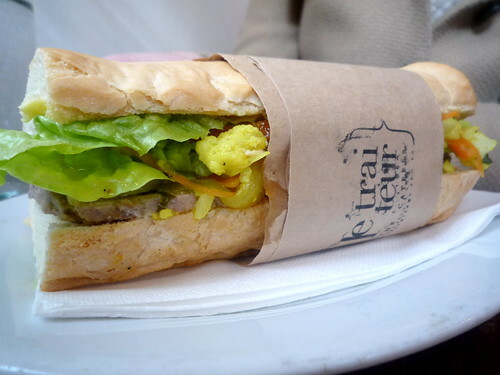 The selection of $9 baguettes include some great combinations like salted beef, Emmenthal, gherkins and mustard mayonnaise (left) and rabbit terrine with bitter leaves and hazelnut dressing (right). 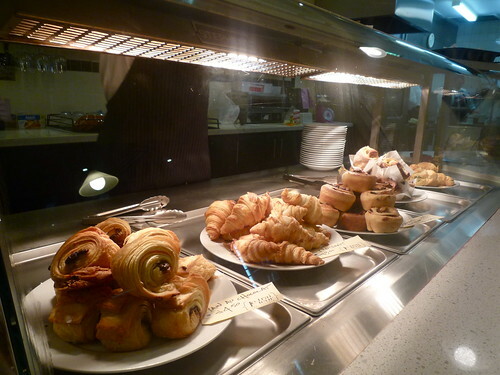 They also have a substantial breakfast menu featuring dishes like oeufs en cocotte and semolina porridge. 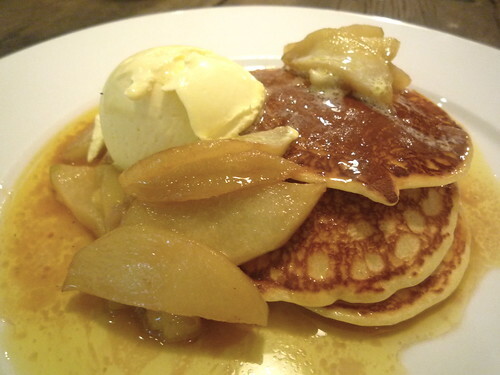 I say go for the pikelet stack with Calvados apples and crème fraiche ($11). I like popping in on my way from Flagstaff station to the office in the mornings to grab a cup of coffee and to try resisting the freshly made pastries. If you ARE going to get a pastry, try the white chocolate and almond croissant. 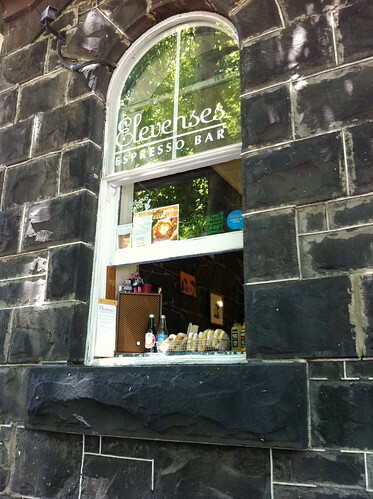 Elevenses is a tiny, endearing cafe run by an enthusiastic young couple who love their coffee (they serve fair trade organic Toby's Estate coffee, offer a single origin of the day, and reconditioned their vintage coffee machine themselves). 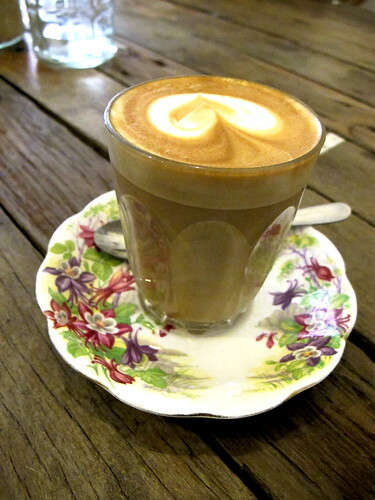 They originally set up shop in Kensington, but a hail storm earlier in the year LITERALLY destroyed their cafe (!!). They recently reopened in a bluestone building down the far end of Little Collins Street, in a somewhat bizarre arrangement whereby the interior space is shared with a printing and parcel packaging business. 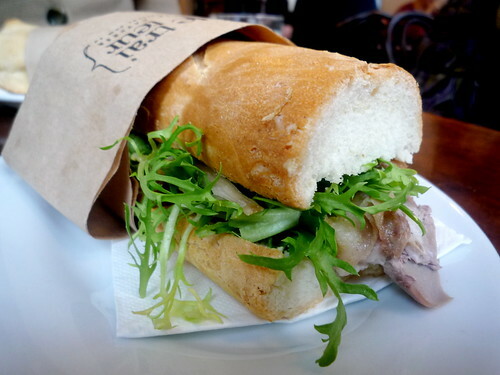 The reasonably-priced lunch menu consists of a small number of sandwiches (made fresh) and a few salads. 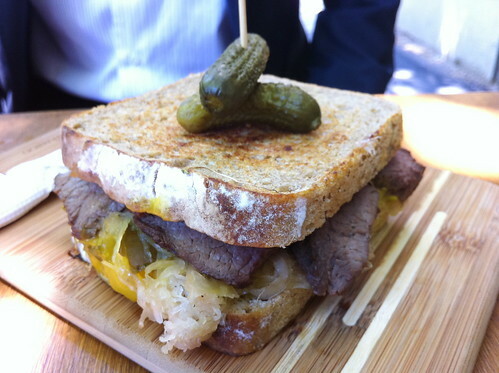 On my first visit I really liked the "Rooben" rye sandwich ($8.40): pan-seared kangaroo topside with swiss, sauerkraut and Zing mustard pickle. On my second visit, when I took my charming colleague J along with me, I resisted the temptation to get the roo again (he ordered it, and loved it), and I tried the bunny instead. 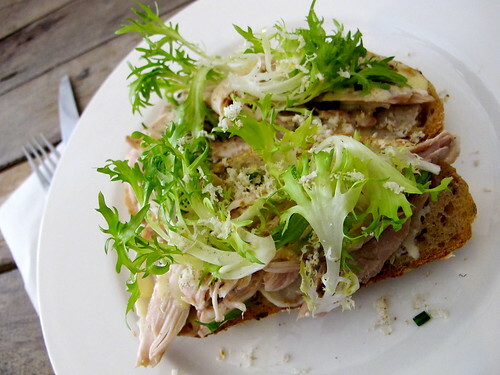 The braised rabbit sourdough sandwich ($8.40) comes with alfalfa sprouts, swiss, tomato, lemon, rosemary and drizzled with honey. Another great combo - the sharp lemon and sweet honey worked so well with the braised meat. 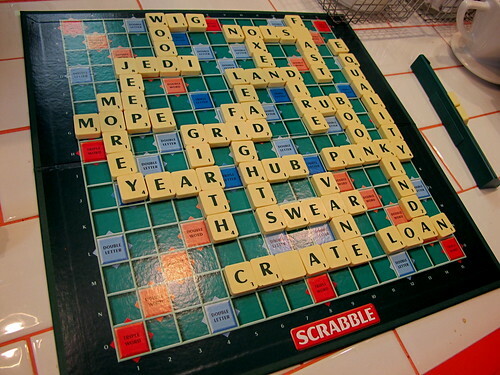 There is a perpetual Scrabble game being played at Elevenses, and patrons are invited to play a turn while waiting for coffee. 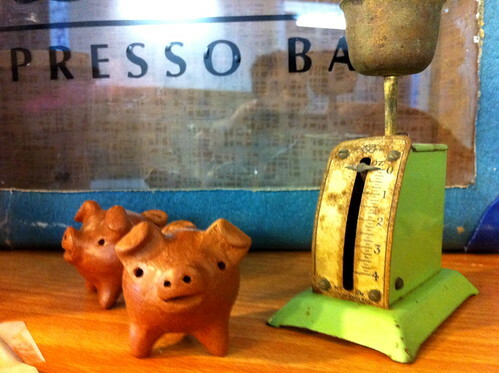 The Chilean chanchitos statuettes (a wedding present for the owners) bringing good luck to the cafe are a cute touch. 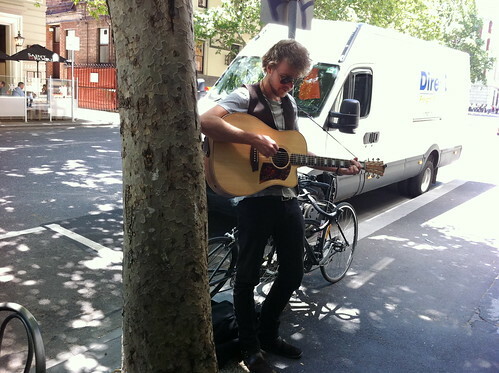 When I lunched there with J, we sat at a table out on Little Collins Street to enjoy the sunshine, and were promptly serenaded by a bloke with a guitar. Romantic! My favourite thing about the latest cafe opened by Melbourne coffee tycoon Sal Malatesta, The Tuck Shop, is the stack of fluoro lunch trays. I love how they evoke childhood memories of queuing in the school tuck shop. 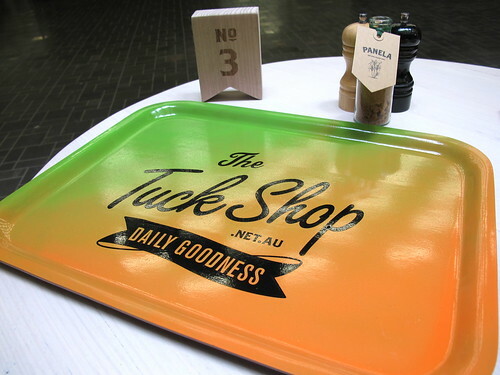 The Tuck Shop is situated on the ground floor of the NAB Bourke Street building (behind which both MoVida Aqui and EARL can be found). 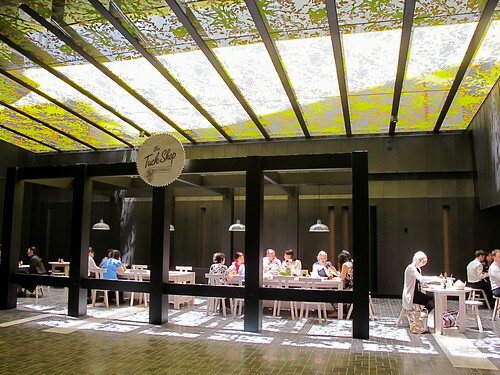 It has a glass ceiling so on a cloudless day the tables are drenched in celestial light. 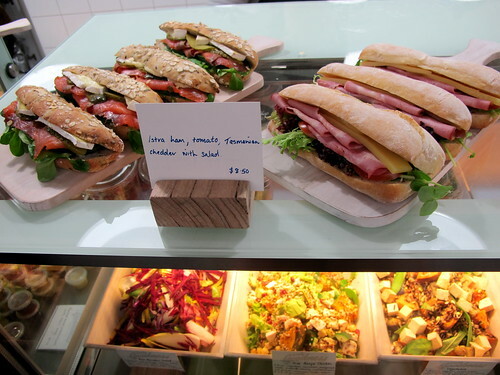 The lunch menu boasts a selection of wraps and salads, a pie, a hotdog and a hot dish of the day. There were a few pre-prepared panini, but they didn't really grab my fancy. 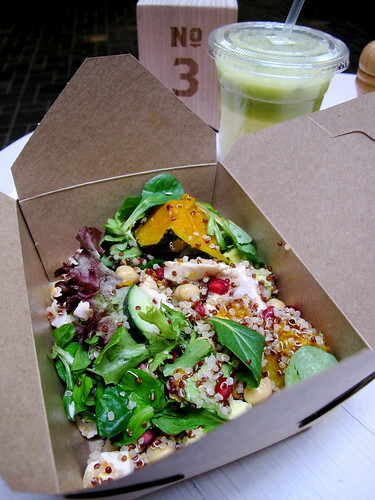 Instead I tried the "original" salad ($8.50): broccoli, alfalfa, green peas, cucumber, avocado, quinoa, merediths goat cheese, fresh mint and toasted seeds. The salad that arrived was rather disappointing: it was undressed and dry, and instead of broccoli there were big chunks of pumpkin (unpeeled). 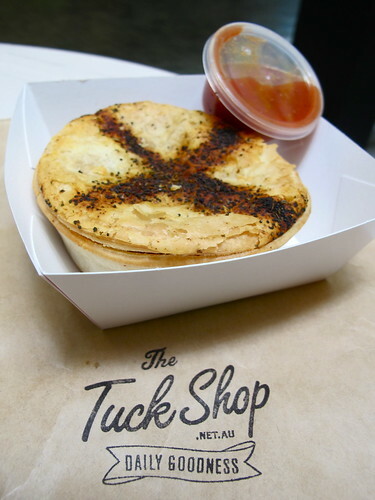 My lunch companion Miss C fared better, enjoying the chunky Black Angus beef pie with Tuck Shop tomato sauce ($6). I wasn't very impressed on my initial visit, but I'll return to give it another try (if only to order the breakfast of fresh cut papaya with Greek yoghurt, pomegranate and raw honey - YUM). 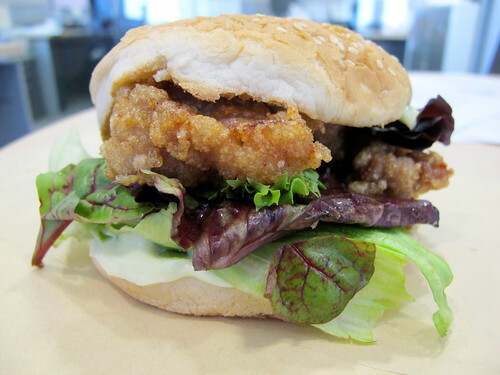 It's a bit of a stretch to call it a sandwich, but the tatsuta burger at K.Shock Bento Box ($6.50) is bloody delicious and, according to a guy I know who lived in Tokyo, pretty damn authentic. I follow his suggestion and ask for it to be made with wasabi mayo (rather than regular mayo). In terms of other King/Bourke-vicinity places I've reviewed in the past, I can report that the curry don at Don Bay Japanese Lunch Place continues to be excellent, and that Espressino outside the Rialto has added proper thin crust pizzas (made in the oven downstairs) to its menu. In the food court at 530 Little Collins Street, the place next door to Yen Sushi & Noodles serves authentic Sri Lankan food. It's called Cinnamons and their eggplant curry is brilliant, as are the hoppers. See Penny's review here. 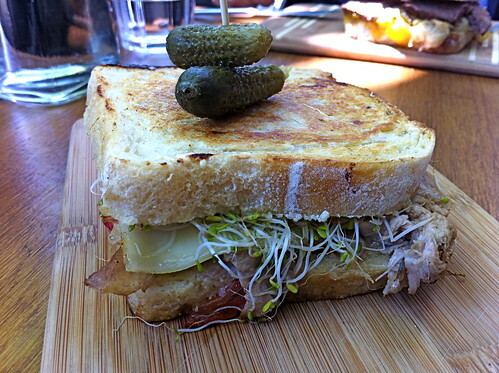 And last but not least, Hardware Societe is a great lunch (and breakfast) option. On my most recent visit I was most impressed with the expansion of their macaron operations, and the improvement in quality (both in terms of smooth shells and nuanced flavours). 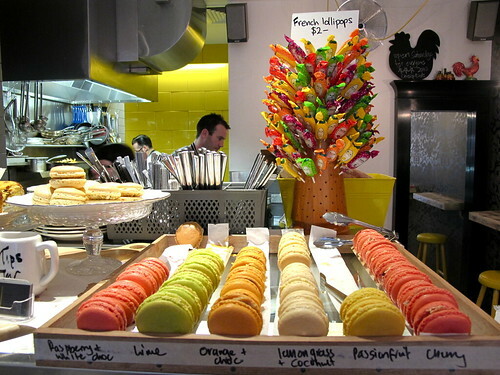 That lemongrass and coconut macaron was to die for! Thanks for posting this up! I'm always at a dead-end to figure what to eat during lunchtime when I meet up with people!! 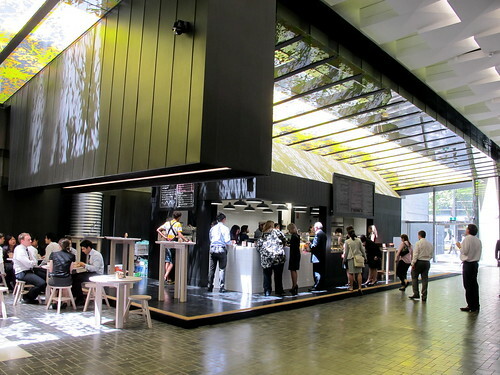 This post makes me realise how bereft we are in Sydney of these type of interesting lunchtime options in the CBD. I am jealous. how brilliant.....i don't need to ever read gourmet....vogue ent again when i am researching my food stops next in melb - i will be researching your blog for tips...you are doing a great job & the businesses you blog are fortunate! thanks. oooo thanks for the post!!! Great post - I remember when there was NOTHING to eat down that end of town. Now there looks like there's lots of nice options. A useful resource if I'm ever down that end again. Oh gosh! If there was ever a post to make me feel even more miserable that my weekend in Melbourne finished yesterday and I'm now back in Canberra, it's this one. Would I be justified spending £700 to fly from London to Melbourne for the Asparagus, mushie pea, slow cooked egg, taleggio cream and hazelnuts? From the look of it, it could be money well spent! 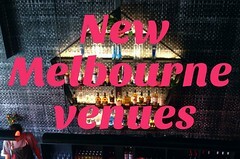 Your passion for food and Melbourne on your blog has inspired us, to say thank you, we are passing on two blog awards. Please visit our blog - http://happyvalleycook.blogspot.com to accept your awards. We thank you for sharing with us your food journey. Cheers Jutta and Chocolate Cookie. this rocks. i know you're pain about finding good spots around the legal centre. it has definitely picked up. All those places look wonderful. I have nothing like that around where I work, although we do have a big lake, so I guess that's a plus? 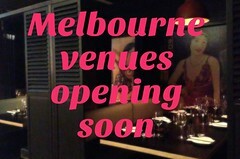 I was wondering if you knew of any good italian restaurants in melbourne CBD? Great round up! Lots of these places are place that I have vaguely heard of through Twitter but never actually seen.